Advances in Productive, Safe, and Responsible Coal Mining covers the latest advancements in coal mining technology and practices. It gives a comprehensive introduction to the latest research and technology developments, addressing problems and issues currently being faced, and is a valuable resource of complied technical information on the latest coal mining safety and health research. 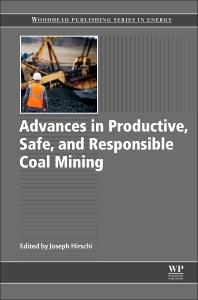 As coal's staying power has been at the forefront of the world’s energy mix for more than a century, this book explores critical issues affecting coal mining, including how to maintain low-cost productivity, address health and safety hazards, and how to be responsible environmental stewards. This book takes a holistic approach in addressing each issue from the perspective of its impact on the coal mining operation and industry as a whole. Dr Hirschi is a Productivity Analyst in the Smart Solutions group. Prior to embarking on this new role, he was a project manager for the Illinois Clean Coal Institute leading their research efforts in coal mining and preparation. He has adjunct faculty status in the College of Engineering at Southern Illinois University, the institution from which he received a PhD degree in Engineering Science. He received BS and MS degrees in Mining Engineering and a MBA degree from the University of Utah. The first half of his career was at the Galatia Mine in southern Illinois where he was a safety technician, operations foreman, and mine engineer.